Our developers always try to provide you with the possibility to use our components in different ways. In this article, we’ll talk about dhtmlxGantt. We’ll learn how to use this component with the Laravel framework. Laravel is a free, open-source PHP web application framework. Laravel was created for the development of web applications following the model–view–controller (MVC) architectural pattern. It will be a step-by-step guide intended both for developers who have already been familiar with Laravel and those of you who only starts working with it. We’ll use Composer to install Laravel. It’s a dependency manager for PHP that allows you add required packages to your projects in a fast and easy way. Usually, you can find it in your Linux repository. In another case, you can download installation files from its home page. This code will create the dhtmlxGantt folder and load the Laravel files along with its dependencies into it. One more thing before getting started. Download the dhtmlxGantt package and unpack its content within the public/dhtmlxGantt directory. That’s it. Preparations are finished, and we can continue creating the Gantt chart. Done. The database is created. 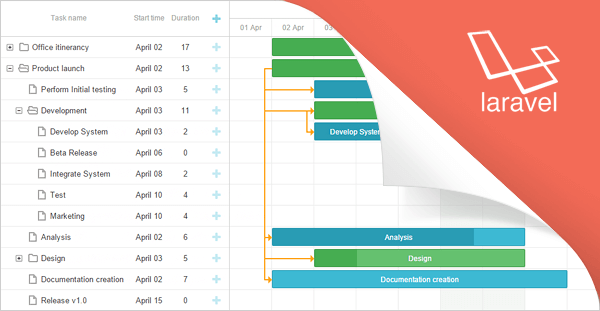 Our next step is to create a the Gantt chart itself. As it was said before, Laravel follows the MVC architectural pattern. Since MVC means Model-View-Controller, the process of creation will consist of three main stages. To access the data we need to specify the appropriate model class. You should create two files within the app directory of your project. The GanttConnector constructor takes 2 parameters: null means that we want to use a model, not a database; PHPLaravel – the module for working with PHP. The render_links method configures connector, retrieves data from a table with links and takes three parameters: the method creating a model for links, the name of the link id, and a comma-separated list of rendered links. The render_table method configures connector and retrieves data from a table with tasks. It takes three parameters as well: the method creating a model for tasks, the name of the task id, and a comma separated list of rendered tasks. You should define the hostname, name of the database that we’ve created earlier, username, and a password to allow Laravel use the data from a database. That’s it! Now we can test the application. Here are the tasks from the database dump file that we’ve imported earlier. You can edit them or create your own, using the “+” button. That’s all. We hope you have enjoyed the tutorial. The final application logic was not the goal of this article, but the interface built here is a good start for creating a fully-functional web application. Hi, first i want to thank you for this post it was much of help. how to create gantt_tasks and gantt_links tables in laravel app. unable to understand it.